Industrial style is HOT right now. Spring is HOT right now! Bam! What about an industrial style spring project. Throw in a few lambs and what do you have? 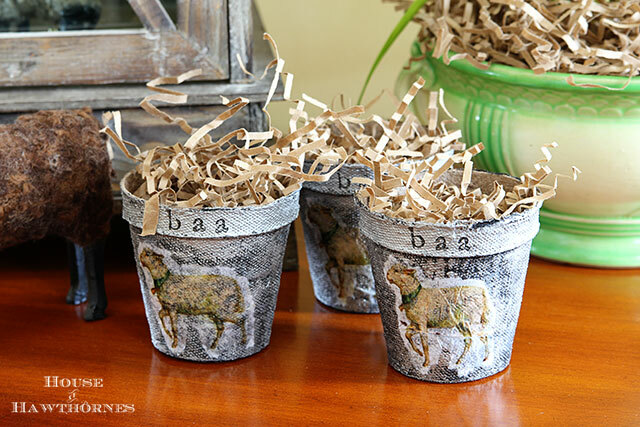 Lambs on faux zinc peat pots, that’s what! OK, so it’s not all pastel colors, Easter bunnies and green plastic grass. But I’m feeding the industrial style girl that lives inside me. And she’s hungry. Now I know some people would do a detailed ninety-nine step tutorial on how to make these, but come on, they’re peat pots people. I just painted them, Mod Podged a lamb from The Graphics Fairy on to them and then stamped the word “baa” on the lips. The most difficult part (and even that was not difficult) was making the peat pots look like zinc. Please refer to my tutorial on Making Zinc Letters And Numbers for very detailed instructions on how I did that. I guess I was more into writing up a tutorial back in my younger days. You know, three months ago. 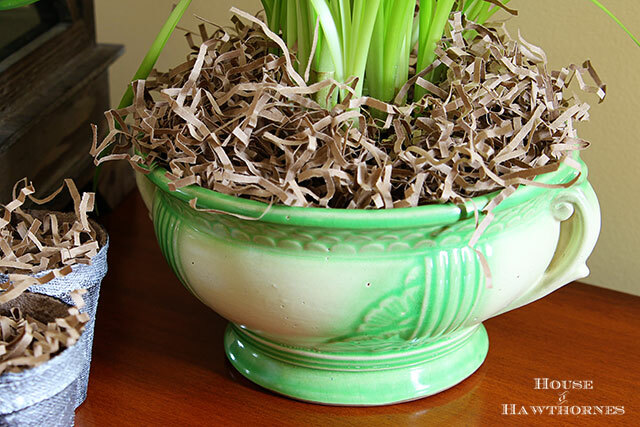 Do you see all the brown-paper-bag-looking shredded filler I’ve used in the peat pots and around the daffodils? You can buy it in the gift wrapping section at Dollar Tree. And guess what? It’s a dollar! 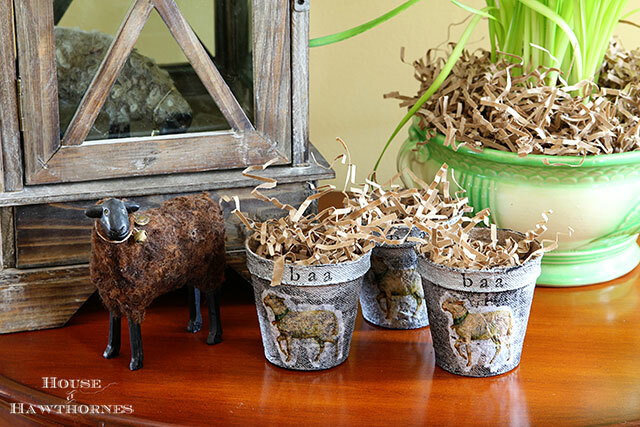 You can see another of my spring peat pot crafts – Easy Spring Peat Pot Baskets. 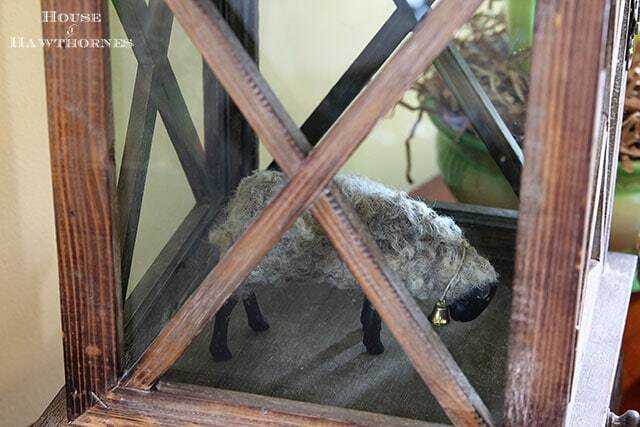 To round out my vignette, I trapped a lamb in my lantern. If he’s good, I’ll let him out to graze on some grass soon. 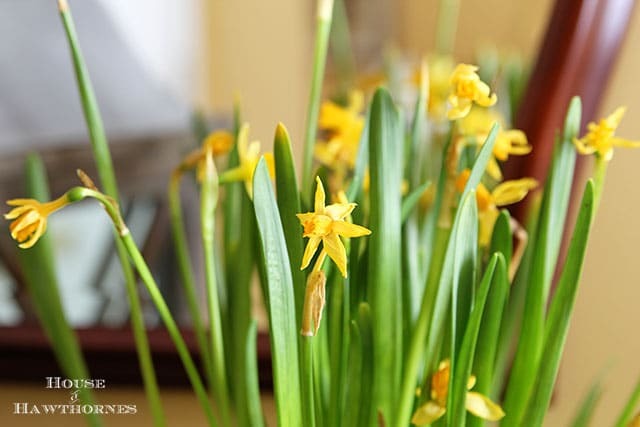 I adore these daffodils that I “planted” in my vintage tureen/casserole/bulb dish. They are really sitting inside of a Tupperware bowl with the shredded filler hiding the circa 1974 orange plastic. I always hate to actually plant in a vintage planter. Sort of ironic, no? Now moo-ve on out of here. Wait, that would be a cow, so let’s say come baa-ck soon! I love you!!! you crack me up. i really love your blog, we are very similar. it makes me happy when i see that you have posted. You are so funny. I hate long wordy tutorials. I mean like “place a glue stick into the barrel of your glue gun, turn it on and be careful it gets hot.” UH DUH! Just give me the basics and I am good to go! Gotta make a list of all the things I will take from your house when you are gone………OH wait – I am iced in my house by six inches of solid sleet with snow on the way. Darn it. You know we’re ready for spring when the peat pots come out. Love your trapped lamb. Have a fabulous time away. 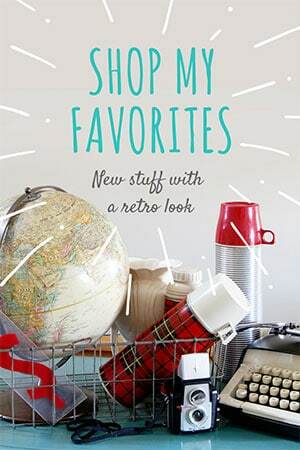 I think many of us are making mental lists of things we’d gladly borrow from your darling abode. I feel the same way about planting in old planters. Besides, plants do best when excess water can drain out, which wouldn’t happen if there wasn’t a container within the container, so we are really doing what is “right” by our plants. Are we all trapped in the next ice age and just don’t know it? It’s March and the temps are as cold as January…worrisome. These are sweet. Clever too. I LOVE your peat pots. The BAA really makes them. Cute idea and I won’t plant in vintage planters either! How creative is that? I envy you! I can never come up with these kinds of nifty ideas. Great job! Pam, I have emailed you before telling you how much I love your posts. Like Heidi who commented, it makes me happy to read them. 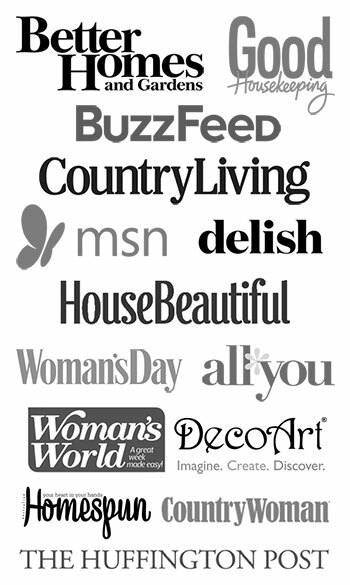 I’m subscribed to lots of blogs via email but I always do a quick scan looking for yours. Love the sheep and pots! the “Zinc” peat pots are absolutely adorable. Love them! I use peat pots for lots of projects in the spring. And must try this one. Please be safe on your journey. 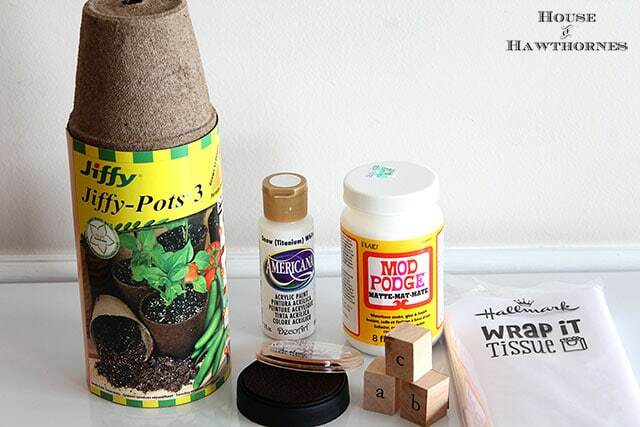 What a cute project for spring! 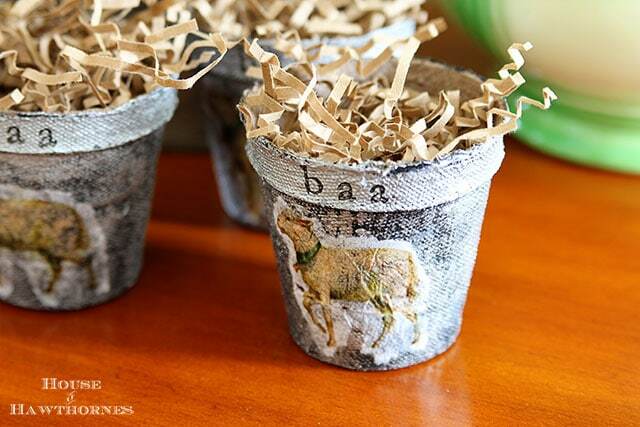 I love how you stamped Baa at the top of each pot. These are so so cute! I need some peat pots…pronto! Sweet hugs! 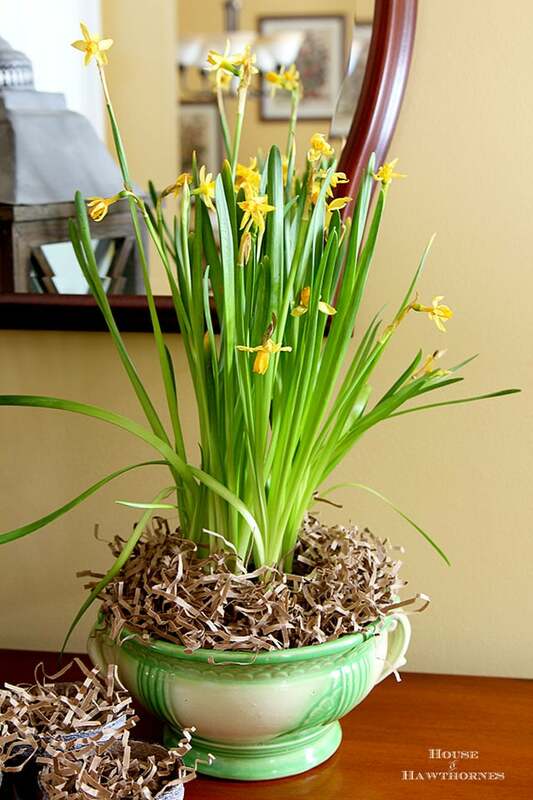 I’m loving your springy themed peat pots and daffodils on your table, Pam! I feel the need to add some spring inside,too, since the outside refuses to cooperate. Drive safely!! Love these. They definitely say spring to me. Happy to be cohosting the party with you. So sweet. Perfect for the season. LOVE these, Pam…they are adorable! Beautiful zinc pots! Love this idea Pam! Awesome! Sharing on FB later today!! Your daffy are lovely in that planter though. I have a fern growing outside in an old planter but it is thriving even in winter and I normally kill them so there. This is lovely, Pam! Such an encouragement that spring is coming! I’m pinning! How adorable! 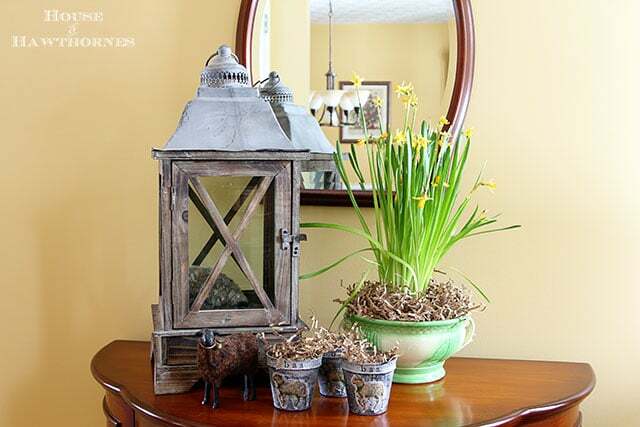 Lambs have been calling out to me this spring and I’m sorry now that I passed up two darling ceramic ones at the local consignment shop because they would have made excellent additions to my spring table. Thanks for sharing this wonderful project. Never seen this done before – just love it and will try it out! Pam, these are so adorable!! !